Group photos are at or near the top of the “Not As Easy As It Looks” list and even more so when the group is your boss’ boss’ boss’ bosses. 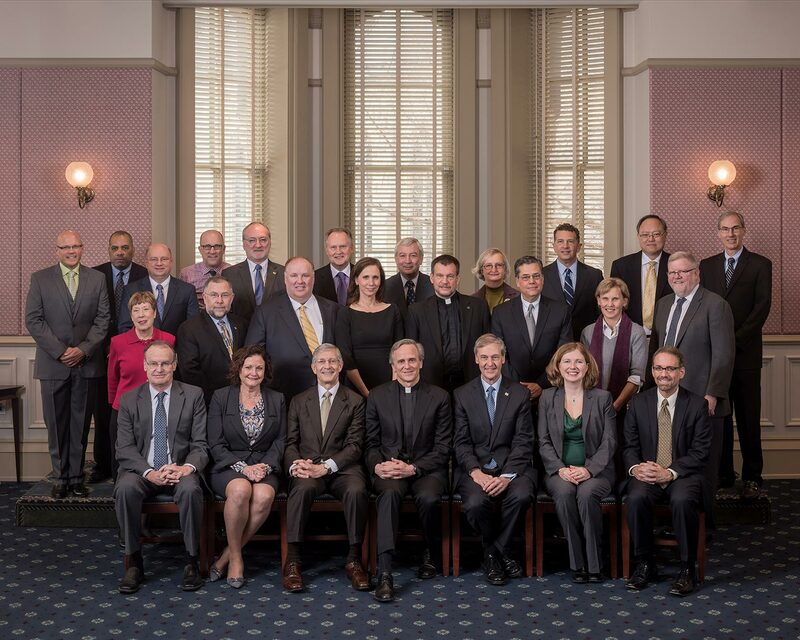 Every year the Notre Dame yearbook, The Dome, does a group photo of the University leadership–the President, Executive Vice President, Provost, officers and deans. The Dome was a huge part of my education as a photographer and I wouldn’t be doing what I do today without my years spent in the Dome darkroom. (Yeah, we used film then!) So I’m more than happy to help out with this annual photo, which we did earlier this month. Our University leadership is a busy group…they don’t get together all that often and when they do it’s important to be efficient with their time. We have to get the photo done quickly and get it done right the first time, because there simply is no opportunity for a re-take. That means being prepared: Prepared with a strategy on how to arrange everyone (How many people total? How many rows? Do we need chairs? Platforms or risers?) Prepared with a location that can fit everyone and the equipment needed, and be dedicated to the job. Prepared by testing the lighting and exposure as much as possible to be sure there are no odd shadows or hot spots. In other words, get there early, test, check, double-check, and test again.